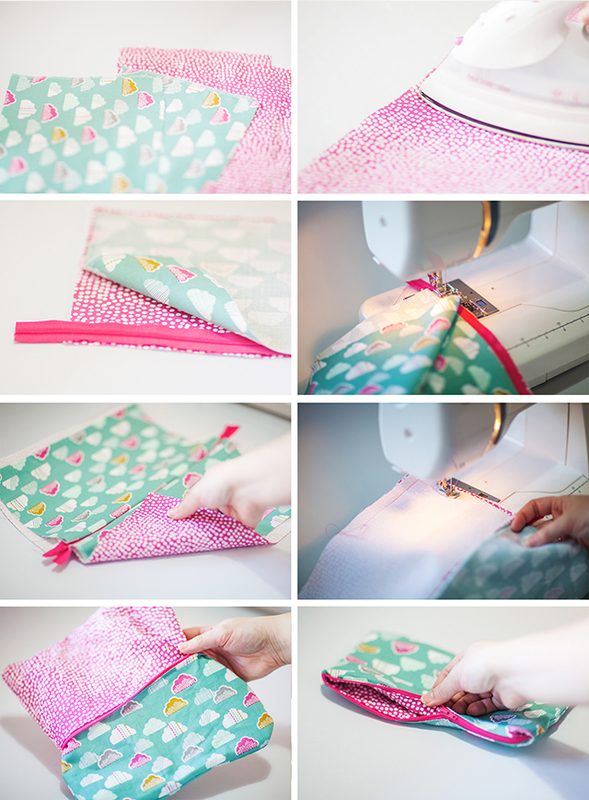 Being Makers Month here on our blog I wanted to create a tutorial for you that used home grown fabric. I love American fabric designers like Robert Kaufman, but I have recently fallen in love with a new British company Dashwood Studio. 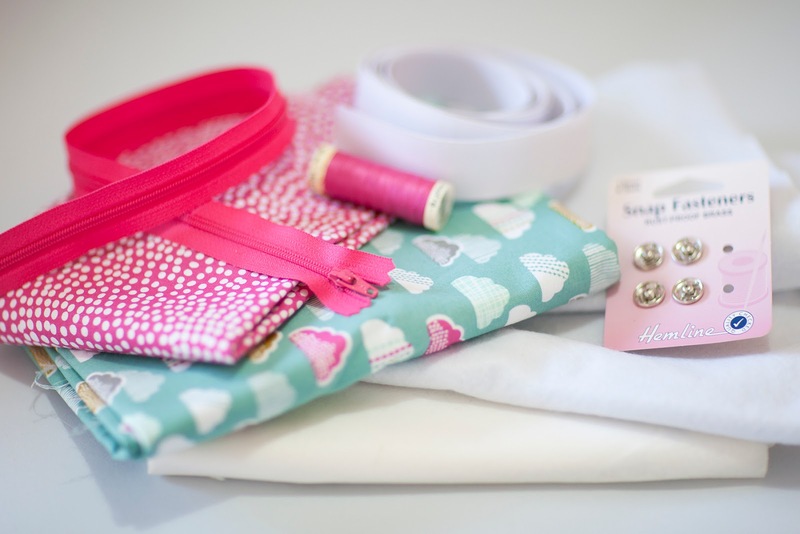 We stock their fabric in my shop Sew Crafty and they are a great seller for us, our customers love that they are a British company using British designers. David Sweet (Awesome name), director of Dashwood was kind enough to tell me a little about their company. ''Dashwood is just over a year old , its been exciting. We have had a lovely reception from customers . I think the domestic market was eager for a home grown fabric company producing quality contemporary collections. We only use UK designers , there are so many talented artists here , they bring a different aesthetic to the design process, its a nice alternative to all the American fabrics companies . 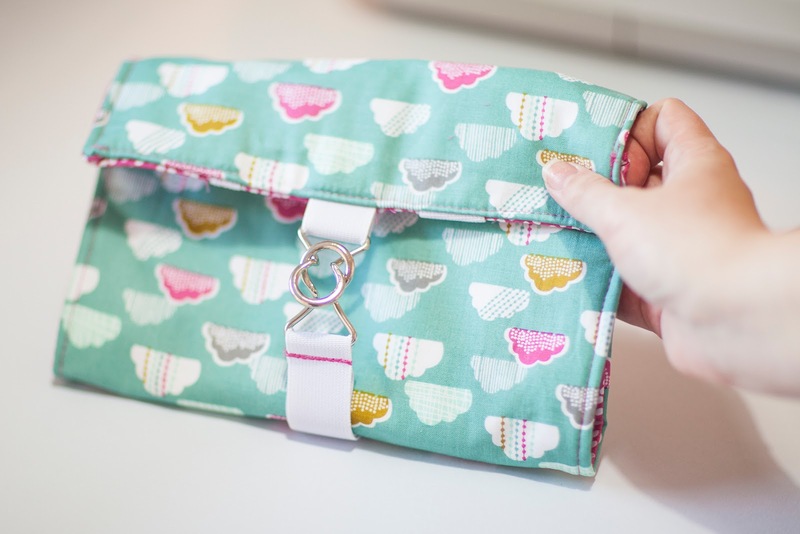 You may have already seen that we used Dashwood Studio fabrics in our feature for Mollie Makes and again for this project I have used their Petit Street collection. 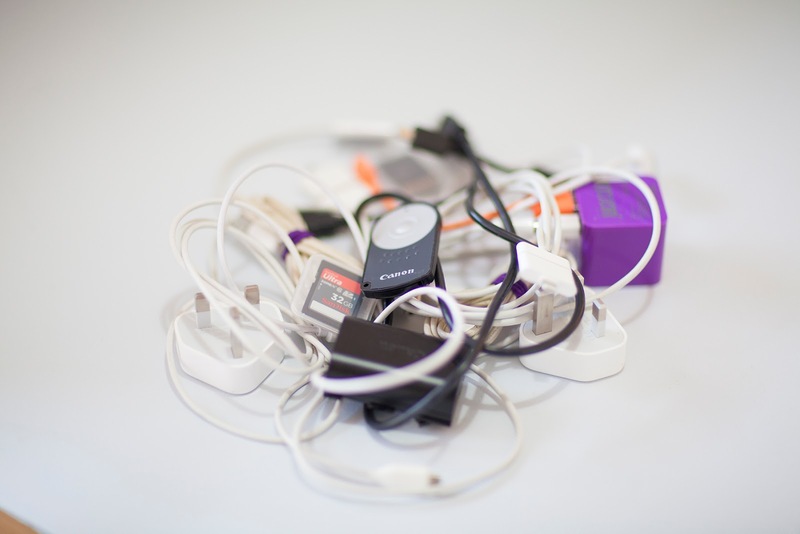 This is the mess of tangled cables and gadgets and thingys that usually lurk at the bottom of my bag or in a pocket if I am lucky, some live on my desk and they are nearly always tangled. Fun huh! I have been waiting to make this piece for ages and playing around with the design and when packing for my holiday I just bit the bullet and made one up. the solution to my untidy cable issues. A Home and Away Cable Cosy. You will need: Two 1/2 metre pieces of contrasting fabrics, 1/2 metre medium weight iron on interfacing, 10'' zip, thread, poppers, elastic, a small belt clasp, 30cm of felt, scissors, iron, sewing machine and pins. 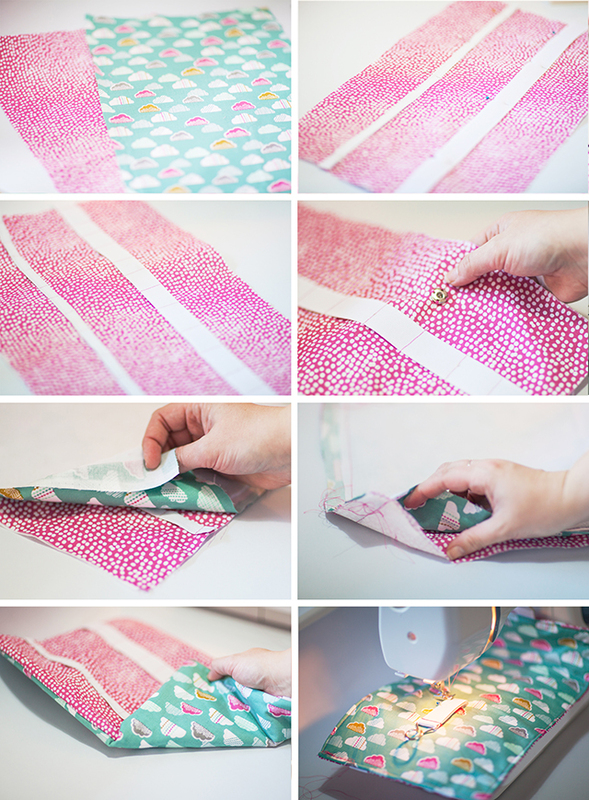 As always you can make this project without a sewing machine, by hand sewing your pieces together. Start by making yourself a zip accessories pouch, I used the same technique as we did in the make-up bag tutorial we did last year. Start by cutting two pieces of each of your fabrics, I cut mine 23cm x15cm. Iron on interfacing to the fabric you want to use for your lining. Then pop your zip in-between the two right-sides of your lining and outside fabric facing up towards the outside fabric. Sew the zip in place. Fold both pieces back and repeat on the other side of the zip. 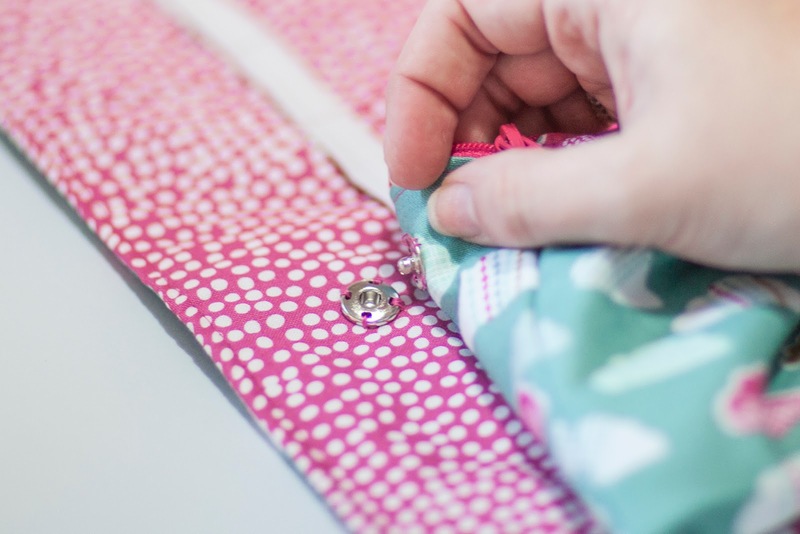 Fold the second lot of pieces back and run a line of top stitching to hold the fabrics away from the zip teeth when the pouch is in use. Now undo the zip halfway. Once you have done that, take the two outer pieces and the two lining pieces and pin them together facing each other. Sew all the way around the outside and the lining leaving a small 7cm opening in the lining. Turn the whole thing inside out and hand sew up the hole in the lining before pushing the lining inside the pouch. 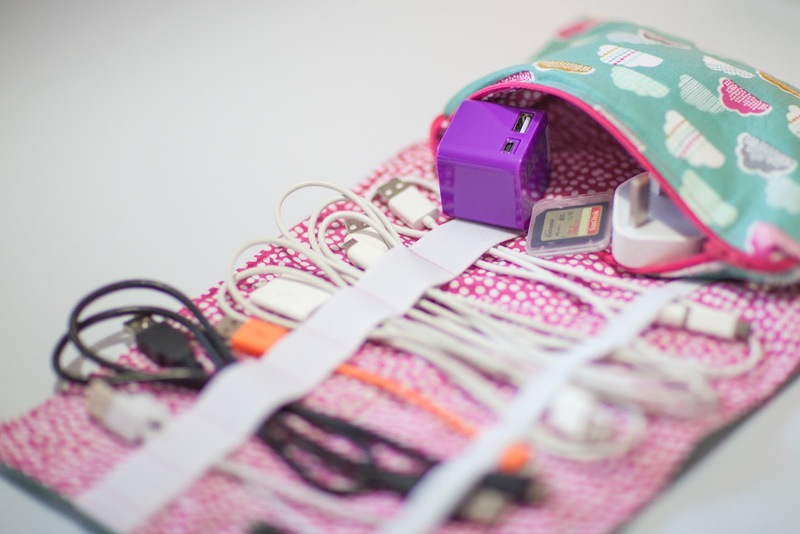 To make the cable tidy part of the cosy, cut two larger pieces of your fabrics 25cm x 45cm and iron on some interfacing to the lining fabric - again to give it a little more body. Then pin two rows of elastic along the longer length, mine were about 7cm apart. Sew the elastic at between 2-3cm spacing all the way down the length, varying the spacing as you go to fit larger and smaller cables, across both rows of elastic. Then sew one side of your popper into place about a third of the way up and about 3cm in. Take a small length of elastic and your belt clasp and loop the clasp onto the elastic then sandwich that at the top edge between your two fabrics right sides facing. I also added a layer of felt to the sandwich to help give a little protection to my cables if I am taking it around with me. Sew all the way around all of the layers, leaving about a 5cm gap at the end. Turn the whole piece inside out then sew all the way around the outside with a neat top stitch. attach the other end of the buckle with some more elastic and attach it on the outside of the cosy. If like me you are using a directional fabric, think about which direction it will be facing when it is folded as well as when it is hung up, I wish I had made mine the other way as you can't really see that it is the right way up when it is hanging and it looks upside down when it is folded up on the outside. Also don't forget to stitch the poppers onto the zipped pouch so you can attach it when it's hanging or take it off if you need to take it out with you. 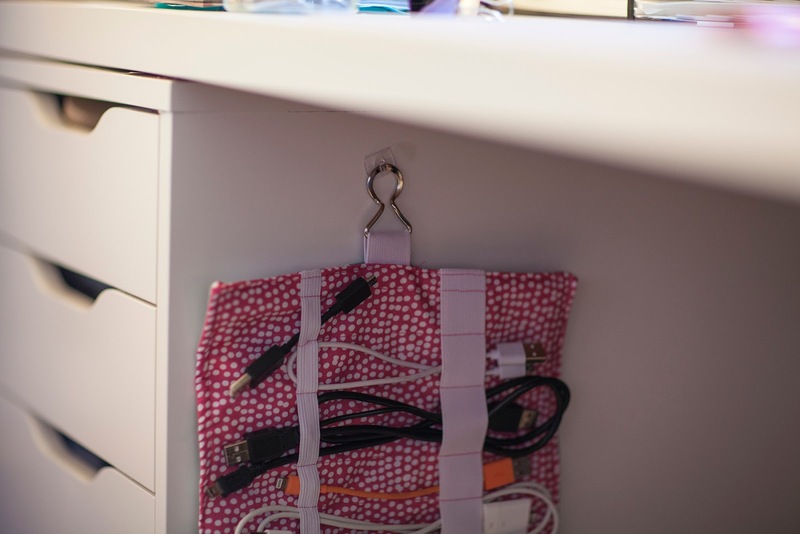 There you have it, a cable tidy/ gadget accessories cosy that can hang neatly under your desk and come out with you when you need to travel with your tech. I put all my cables in the elasticated tidy section and smaller items like memory cards, my Juice cube and plugs can go in the pouch. Mine now lives happily on a contact hook under my desk most of the time, but neatly fits in my hand bag or camera bag for when I am out and about. 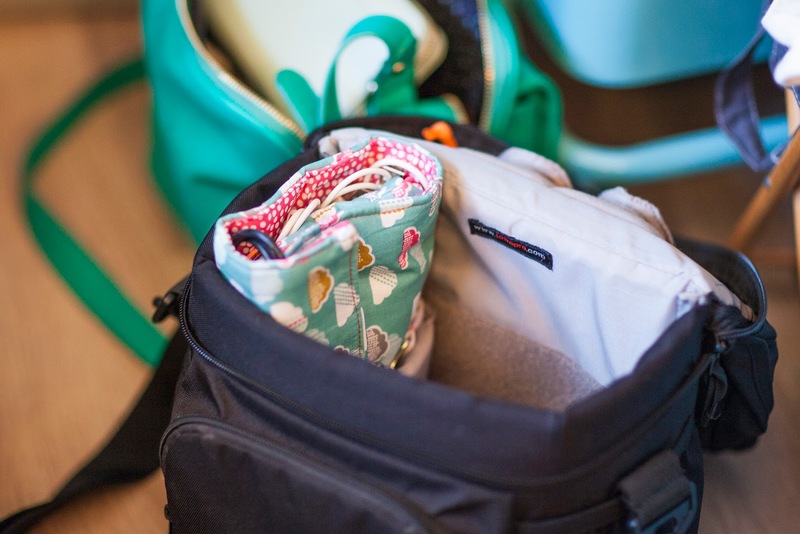 I love that I can also just pop a few accessories in the zip pouch if I don't need all my cables on the go. Do you have a favourite British fabric company? or fabric designer? Do your cables end up like mine? 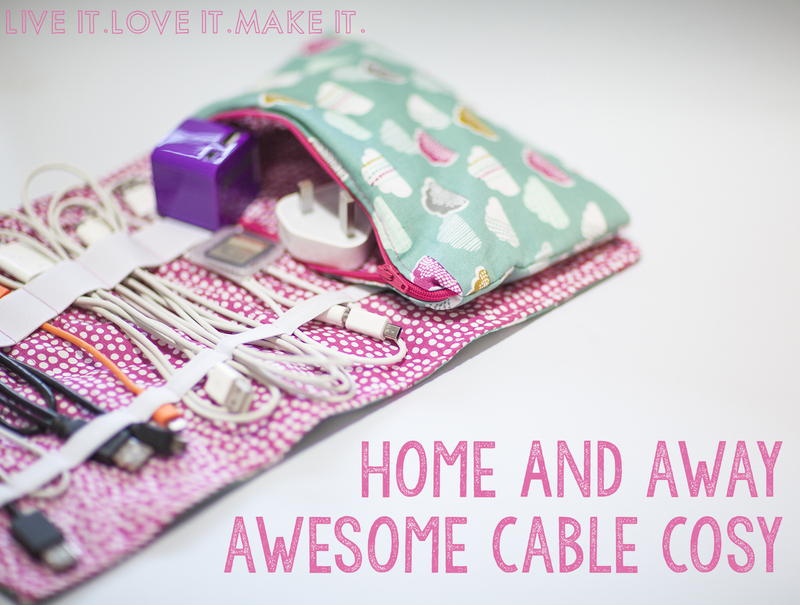 Will you be making yourself a cable cosy? Or maybe making a bunch for Christmas gifts? (sorry I mentioned the C word) If you do, post a pic and #livelovemake so we can see! We have added a PDF of this project so you can download and keep it for future reference. This is amazing! Need to save this for when I get a sewing machine. Hi Lauren, Thank You <3 You could totally make one without a sewing machine, maybe a bit of decorative blanket stitching and some bondaweb you would be well away! I'm really happy to see dash wood studios doing so well and using British designers. I love seeing home grown artists and companies. Thanks for this cable tidy tutorial. This looks perfect for my husband, he has (what seems like) thousands of cables tangled in every draw/cupboard/crevice! I'm always looking for gifts I can sew for him, I'm sure he'll love one of these! We love Dashwood and will definitely be using more of their fabrics in future projects. My husband has been nagging me to make him one since he spied mine last week too! They would make a great gift for boys who love their gadgets. love your site and ideas, but could I make a suggestion? for us old school people who like to have a hard copy of a pattern, could you post a printer friendly version? Thank you and what a great suggestion! We will absolutely work on adding printable patterns, maybe worksheets, to our posts, you are right I am sure a lot of people would like to be able to keep a copy on file for use in the future. If you would like to email us liveit.loveit.makeit@gmail.com I will email you a copy of a printer friendly document of this tutorial when it is ready. Great idea. I'm always looking for small useful sewing projects. Thanks Shirley! Always handy to have little projects like this around. I made this today & it turned out so super-cute! Thank you for the great tutorial, I'm taking it on vacation this week! That's awesome! Hope you have a great time on your vacation. Tweet us a picture if you get a chance won't you #livelovemake . Or email it to us at liveit.loveit.makeit@gmail.com we always love to see when people have made things from our tutorials. Hi. This is a great tutorial. I'm gathering supplies to make this this week. I'm not sure I understand where the felt goes. Also I'm from the U.S.- are poppers the same as snaps? Thanks! Thank you, I am glad you like the tutorial, do take pics if you make it and tweet us #livelovemake. Yes poppers are also called snaps or snap fasteners here sometimes too. As far as the felt, I have added a little bit to the tutorial because I realise it wasn't as clear as it could have been. I have used the felt as padding inside the roll and the pouch. So if you place it on the wrong side of the outer fabric when you are sewing around the edges before you turn them through ( on both the roll section and the pouch) it will end up inside the whole thing when you turn it through. I do hope that helps a little with where that is meant to go and why I have used it. That makes prefect sense. Thanks for clarifying and responding so quickly! Hi Miriam, oh no! sorry about that. If you pop us an email at liveit.loveit.makeit@gmail.com we will send you a copy while we sort it out. Yes, what a great idea Jennifer! Perfect for all types of things like that, always good to rework it for your needs. Oooh sounds like a great Sister present idea! To be precise, 1/2 metre is 19 11⁄16in, but roughly around the 19"/20" mark I am sure will work just as well. Good luck and #livelovemake if you post a pic on twitter or instagram. Great news Cara, glad you enjoyed it. Imade tis in an afternoon with my daughter for all her bits when she goes abroad with school in a couple of weeks. We adapted your ideas a bit because I didn't have a zip, so we made a bag with a flop over top, and added side panels to make it a bit deeper. Instead of poppers, we sewed the last section on the elastics large enough to be able to keep the bag tucked in there. Added ties to fasten with. Her friends all want one now so thank you for the inspiration. It re awakened a love of sewing, and a quick project to complete in a couple of hours. That is great! I'm so glad you had fun making your own version of our cable cosy. Those alterations sound good, a great way to make it work for your needs. I am even happier that it has inspired you to sew more. This is sooo cute. 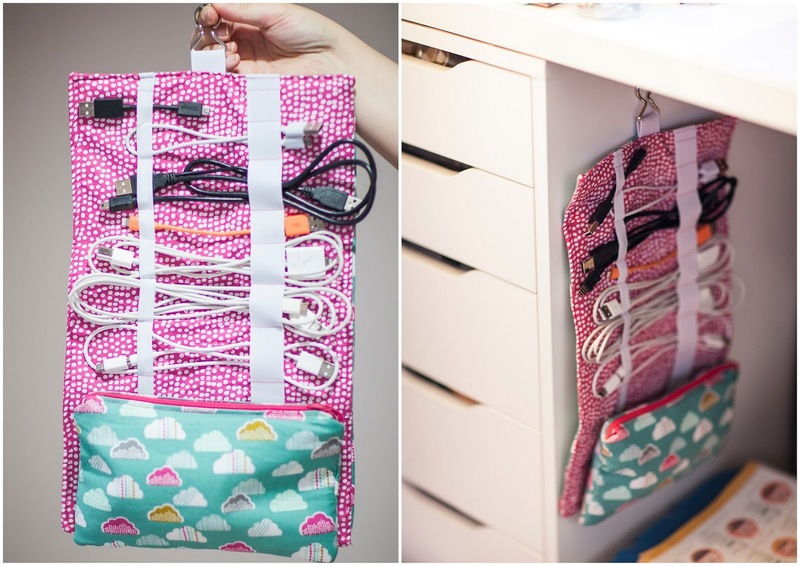 This is a great cord organizer. Thanks for the tutorial. My sisters have been asking me to make them something to replace their plastic baggies. The cable cozy will fit their need. And mines too...lol. Thanks Tea, Its a great present project! and so cute too. Earlier this year I said I would make this project. I did and I love it. Made three more for my sisters. I don't know how I did without. Okay, my cords just thrown in my purse and sisters were in plastic bags. Anyway, I posted pictures on my blog quiltbible.blogspot.com, Please drop by and see. Thanks Tea, They look great. So glad you enjoyed making them too. It took me forever to figure out the part where you said to "Take a small length of elastic and your belt clasp and loop the clasp onto the elastic then sandwich that at the top edge between your two fabrics right sides facing." because you didn't show a pic of it. You only showed where you sewed the other part of the clasp on. It wasn't until I saw the pic of it finished & clasped together, that I understood what you were talking about. It would also help to include the length of elastic, separate materials from tools when listing what is needed. I love this & am eager to do this project! Hi! I loved your cute Cable Cosy, and wanted to make one for myself someday. Thanks to your tutorial, I've made it! Thank you, and please have a look. I'm curious as to why you used two different widths of elastic. Was it just because that's what you had on hand, or is there another reason? I used two different widths intentionally as I was thinking that the thicker one was slightly tighter would be great for holding smaller lengths of cable and the thinner one which was slightly stretchier would be good for holding longer cables. 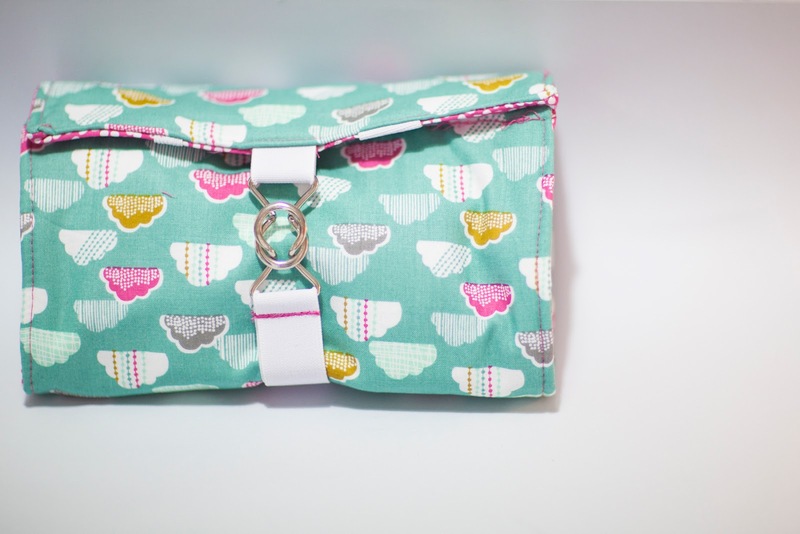 I have found over time that this is the case, which I like for my own personal cosy, But I have also made many for family and friends using the same width of elastic on both sides and that seems to work too. Hope that makes sense? What a fab idea (found on Pinterest). Thanks for the tutorial. Will be making a couple of these -- after the Christmas rush now! - to give as gifts next year. Always looking for useful handmade gifts and this is perfect. Many thanks and Christmas Blessings to you and yours. Oh, are Dashwood fabrics available in Australia as I have not seen them before but live the designs? Thanks Diana, Merry Christmas to you too. I found a few online stores in Australia that do Dashwood Studios, try fabric fox or fabric pixie. I am sure you could find more with a quick google search, but these were the first 2 that came up! Love it!! My wires are always tangled and sometimes missing, so I need one! Thanks for the tutorial! For those of us across the Pond: 1/2 metre translates into a bit more than 1/2 yard (actually about 19.6 inches), but what's the fabric width? I don't know what's standard in the UK. Cotton fabrics here are basically 44-45 inches in width, which is over a metre (a metre is about 39 inches). Is the standard width about a metre or more or do you use inches for that (and we can all just say 45 inch fabric)? Why I seem so confused is that I googled this and all I got was that the UK uses yards and inches in fabric measurements . . . Otherwise, I think your solution to the "tech cables and bits dilemma" we all seem to be facing is genius and I'd love to make one for myself and as gifts. Thank you very much for your great tutorial. Just WOW! I haven't used my sewing machine for a while but after I've seen your cablecosy I had to sew one as well. So my cables have a nice home on my travels. I just made this as gift for sister in law, really pleased with way it turned out, thanks for the tutorial. LOUISE. thank you for that wonderful project. I made one for myself, but I'm sure this isn't the last one. It is a great gift for all travel addicted, too! But in the end it all worked out - of course with some imperfections - but I am proud and can't wait taking it on my travels with me. It was hard work for me (beginner) and my friend who teaches me sewing. As we are Germans, the instruction was hard work for us since she doesn't speak English and I don't sew and didn't know all the words and I sometimes just didn't know what we were asked to do.. made one for myself, but I'm sure this isn't the last one. It is a great gift for all travel addicted, too!!! !